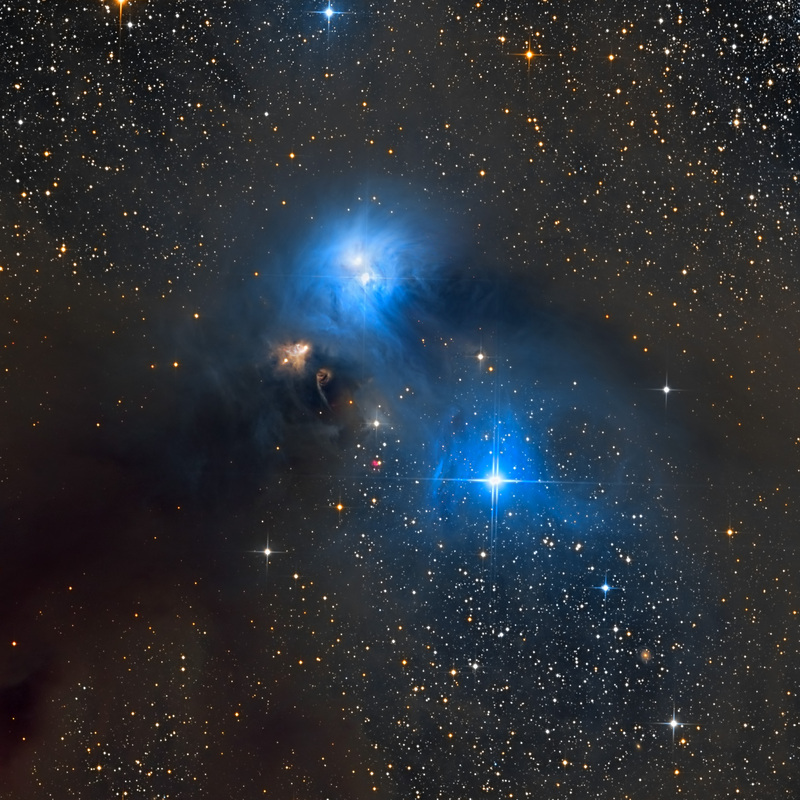 NGC 6726 and NGC 6727 - This spectacular reflection nebulae in Corona Australis are the result of a few bright stars caught up in a large, dusty cloud. The peculiar yellowish curved streak near the two bright reflection nebulae surrounds an intriguing object best seen in infrared light. It is R CrA, a young star still accreting interstellar material on to its surface. These compact nebulae are ejected from proto-stars during the later stages of star formation and sometimes appear in pairs, moving in opposite directions from the hidden star-forming region. The R CrA complex is about 500 light years distant, one of the nearest star-forming regions. IC 4812 - The star in the nebula (IC 4812) shows two distinct diffraction spikes. This implies that there are two stars here, and this is a the well known double star BSO 14 (WD 1450+432), discovered and catalogued at Governor Brisbane's observatory in Parramatta, near Sydney, in the 1820s. The brighter reflection nebula also contains a widely spaced pair of double stars. NGC 6723 (GLC - Sagitarius) Globular cluster NGC 6723 was discovered by James Dunlop from Paramatta in New South Wales, Australia on June 3, 1826 and cataloged as Dunlop 573. 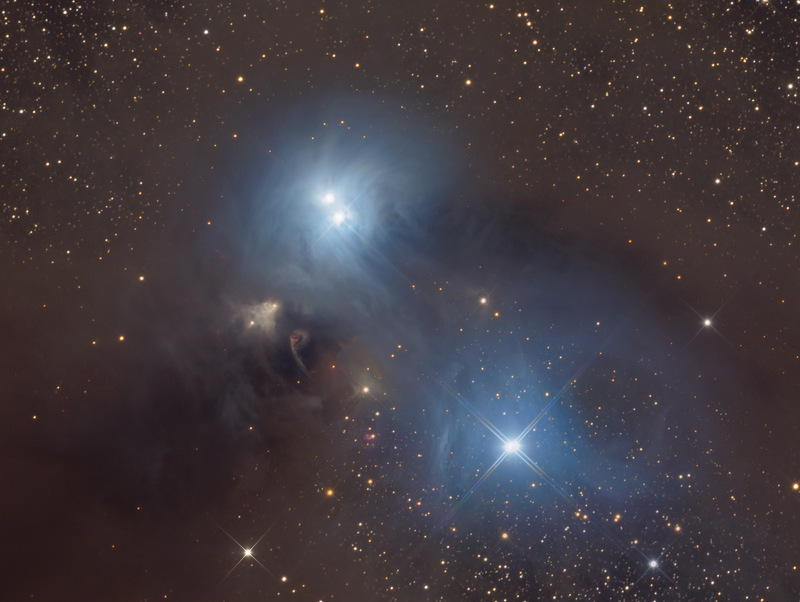 While NGC 6723 appears to be just outside Corona Australis in the constellation Sagittarius, it actually lies nearly 30 000 light-years away, far beyond the Corona Australis dust cloud. 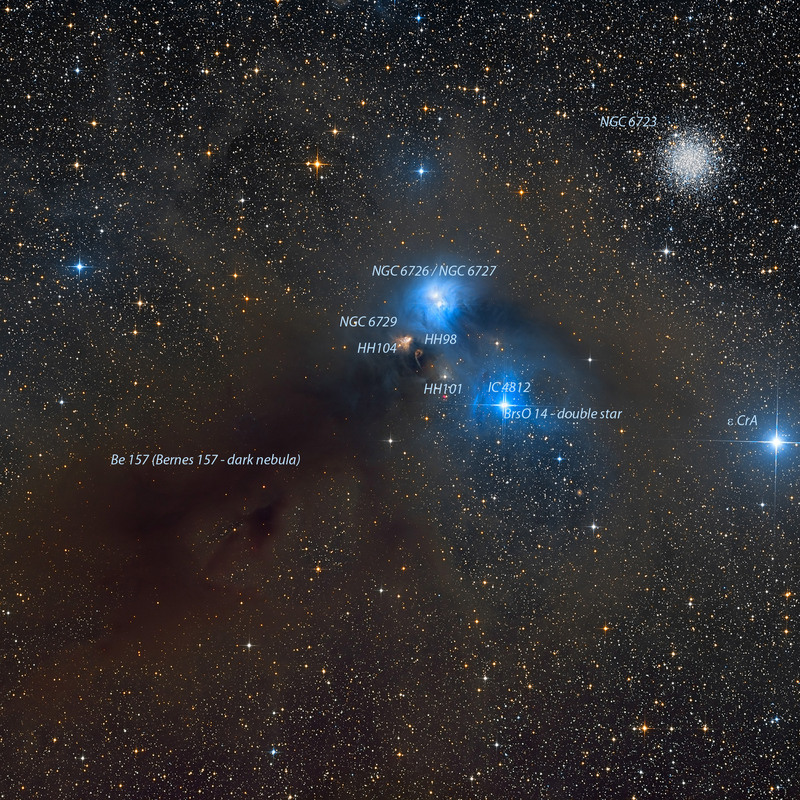 NGC 6729 (BN - Variable Nebula) NGC 6729 is a reflection/emission nebula in the constellation Corona Australis located some 424 light-years away. It was discovered by Johann Friedrich Julius Schmidt in 1861.This fan-shaped nebula opens from the star R Coronae Australis toward the star T CrA to the south-east. R CrA is a pre-main-sequence star in the Corona Australis molecular complex, one of the closer star-forming regions of the galaxy. Be 157 (DN) Bernes 157 is a boomerang -shaped dark nebula that is 520 light years distant in Corona Australis. There is so much content, and it is so tightly packed, that it totally obliterates the background stars. 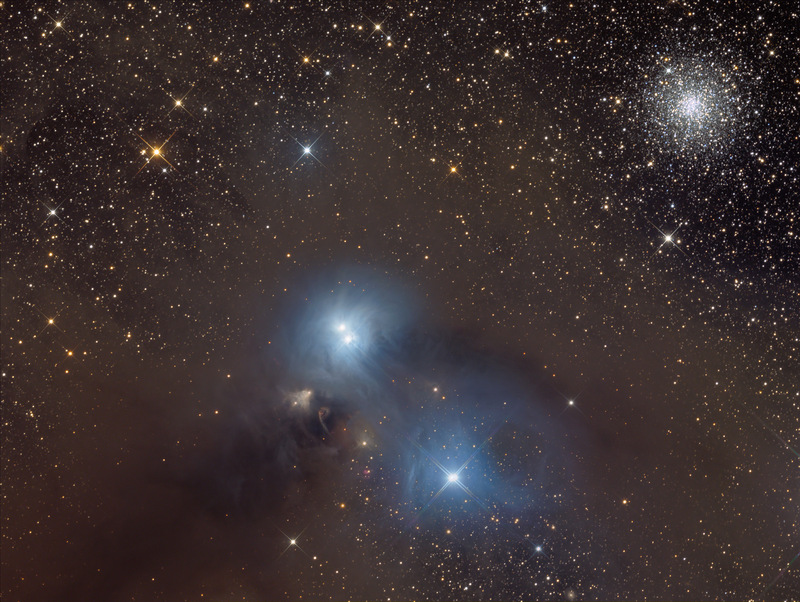 It stretches around the Corona Australis Nebula like a huge, draping black scarf. HH 82, 96, 97, 98, 99, 100,101, 104 - High-speed jets of material that travel away from the baby stars at velocities as high as one million kilometres per hour are slamming into the surrounding gas and creating shock waves. These shocks cause the gas to shine and create the strangely coloured glowing arcs and blobs known as Herbig–Haro objects. Herbig–Haro objects (HH) – after astronomers George Herbig and Guillermo Haro – are narrow jets of gas and matter ejected by young stars at speeds of 100 to 1000 kilometers per second that collide with the surrounding nebula, producing bright shock fronts that glow as the gas is heated by friction while the surrounding gas is excited by the high-energy radiation of nearby hot stars. These objects are transient phenomena, lasting not more than a few thousand years.